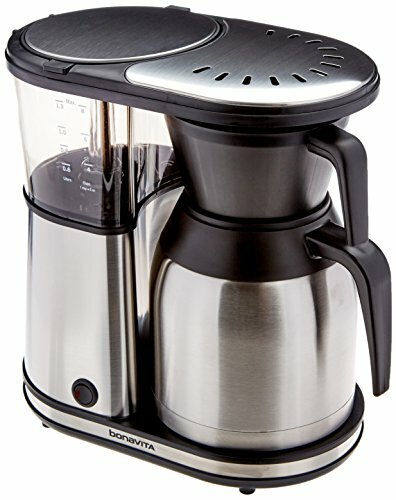 Note: The Bonavita BV1800 8 Cup Thermal Carafe Coffee Maker has been replaced (updated) with the Bonavita BV 1900TS 8 Cup Carafe Coffee Brewer. When the SCAA gives a coffee maker its seemingly impossible Certified Brewer Equipment Award, you have to sit back, pick up your jaw from the floor, and take notice. And the Bonavita BV 1900TS 8 Cup Carafe Coffee Brewer is one of the few machines in the world today that holds this prestigious title. This drip machine’s objectives are simple: to produce a toe-curling cup of java as simply and reliably as possible. And in a world now populated with complicated brewers, which have the power to do everything from grinding your coffee, pouring out a cup, to presumably even serenading you with the latest boy band hit as you sip your joe; it’s good to have a bit of simplicity every now and then. But does the Bonavita’s stripped-off mentality come at the expense of functionality? Well, let's find out! For a modern coffee maker, the BV1900 might puzzle you at first. Where is the LCD display? Where are all the little parts? Where are all the complicated buttons you'll never learn to use? But once you’ve stopped hyperventilating, you’ll start appreciating the minimalist approach Bonavita has taken with this model. The first thing you’ll notice is the pretty compact design. At 12.4 x 6.8 x 12.2 inches, this machine easily fits on almost all counter-tops, and doesn’t need you to move houses just to accommodate it. It isn’t what you’d call breathtaking in terms of aesthetics, but it isn’t horrid-looking either. With a healthy mix between stainless steel and sturdy matte plastic, you might even term it as handsome. That’s right. One button! And on the right side of the machine, you’ll see a plastic filter basket atop the thermal carafe. That's it. Bonavita took the whole minimalist deal and ran with it! This is when you really appreciate the few moving parts the BV1900 throws at you. It's remarkably easy to use! The first step would be to fill the water reservoir. Thanks to the wide mouth and markings, doing so is a total breeze. You then go ahead and place no.4 paper filters into the filter basket, folding the ends to really get a good fit. If saving Mother Earth is really dear to your heart and you don’t mind some fine grounds at the bottom of the brewed pot, you can opt for a permanent filter instead. You then simply load your ground coffee into the filter basket as it sits on top of the carafe, slot that setup into the brewer, turn it on, and you’re in business. If grinding your own beans, gun for a medium coarse grind. If buying pre-ground coffee, first think long and hard about investing in a grinder - it will change your taste buds’ lives- and then ask for a drip grind. The manual calls for about 7g of coffee per cup, but feel free to tweak this to hit your unique sweet spot. Oh you definitely won’t be disappointed by the Bonavita’s brewing process. Thanks to that pretty powerful 1400-watt heater under the hood, it manages to quickly heat the water to that sacred 200F in a jiffy. 6 minutes later and you have a whole 8-cup carafe to treat yourself. And it just can’t be emphasized enough how easy this machine is to operate. If you’d beam it 50 years back, everyone would still be able to get a hang of it in minutes. 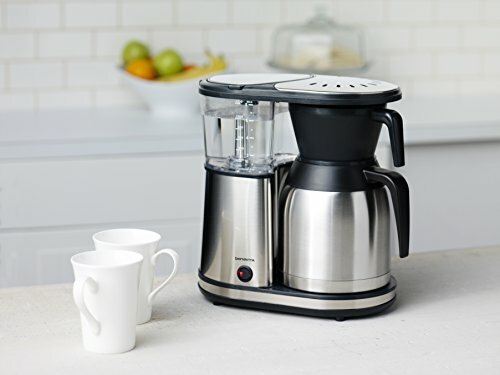 The lack of modern controls and gadgetry might be a bit of a let-down at first, but the longer you live with this coffee maker, you get to realize just how much you don’t need all those buttons. But thankfully, for all of us that don’t own fire insurance, there is an auto shut-off feature that kicks in 15 minutes after brewing has stopped. 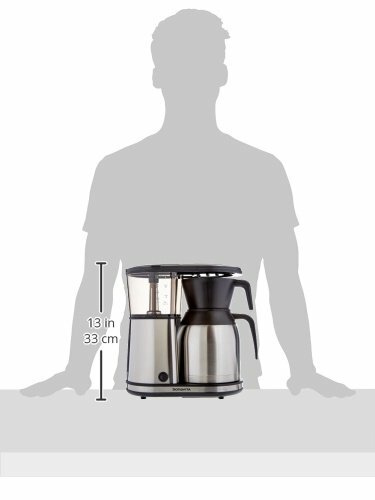 The stainless steel carafe does a brilliant job at keeping that java piping-hot. 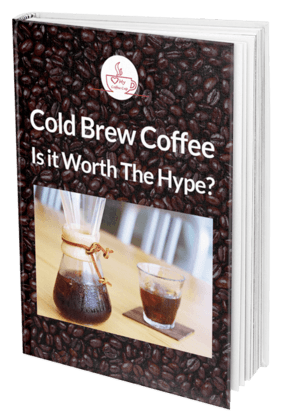 4 hours later, and you’ll still be able to sip on brew that is on the verge of scalding. This model obviously doesn’t have a warming plate, but if that feature really tickles your fancy, you could opt for the one with the glass carafe instead. Admittedly, the glass carafe version has a greater sense of elegance than its stainless steel counterpart, but like all coffee machines with warming plates, risks burning your joe. The 155W-warmer automatically shuts off after 2 hours; plenty of time to have guzzled through your caffeine fix. It might seem trivial, but the one aspect of the Bonavita that sparks the most joy has to be the ease in pouring. We’ve all gone to pour out that morning cup only to end up with hot coffee all over the floor and all in your new shoes; complete mood killer! Lucky for your expensive leather, the BV1900 sports a trigger lid that fits perfectly, which not only makes for effortless serving, but keeps the coffee hotter for longer. Great and hot tasting coffee. Carafe is good at keeping the joe piping-hot. 8-cup capacity might be too little for some. Aesthetics are far from remarkable. 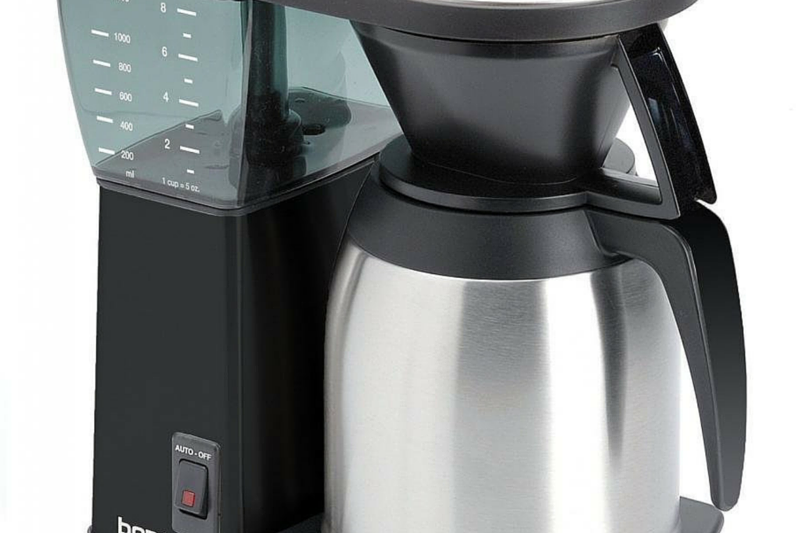 The Bonavita BV 1900TS 8 Cup Carafe Coffee Brewer takes a completely different route than most other modern brewers. Instead of an eye-catching user interface with fancy buttons, it sports a lone switch. Instead of a numerous list of cutting-edge features, it only has an auto-off functionality to its name. But what it does, it does insanely well; and that is whipping up a dance-worthy cup of coffee as quickly and simply as possible. So if you want flash, this isn’t it. But if you want a machine that simply works like a dream, then you just hit the jackpot with this Bonavita coffee brewer.